I pray that you had a blessed Christmas season and a great start to 2017. 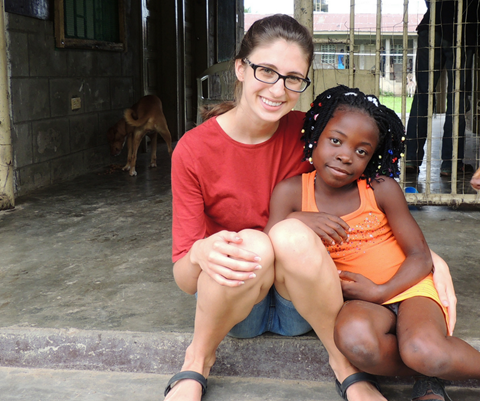 My family and I experienced our first Christmas in Liberia with joy and gratitude. We celebrated the birth of Jesus and welcomed the New Year with our new community. Being that we are from Colorado, it was our first experience of a tropical holiday season. No white Christmas here! This year I heard this familiar Christmas carol differently. Rather than simply a hymn recalling the yearning of the people of Israel for the Messiah, I heard the children praying for Christ to come into their lives anew. Emmanuel, of course, means “God is with us.” The faith of the children of Liberia Mission reminds us that we must invite God into our lives each day. 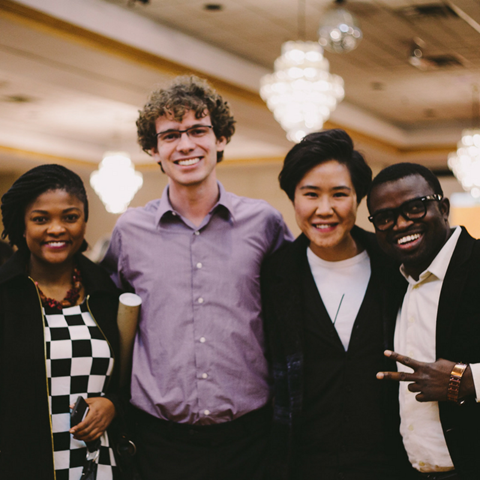 Through this invitation, we acknowledge that God’s action is not something from the past. God loves us at every moment and calls us to a relationship with Him. Thank you for your continued support of Liberia Mission. 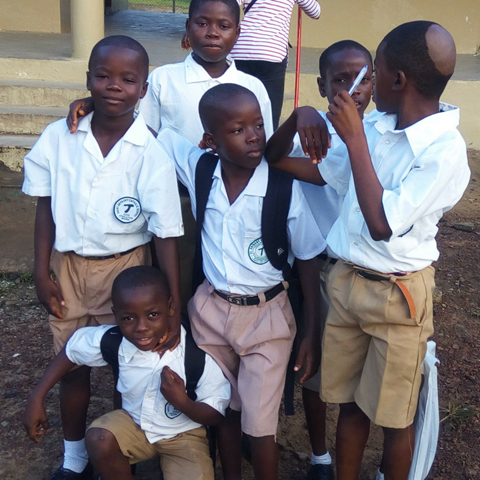 Your prayers and financial gifts provide a school where Liberian youth can grow daily in their relationship to Christ. I wish you a prosperous and blessed New Year! 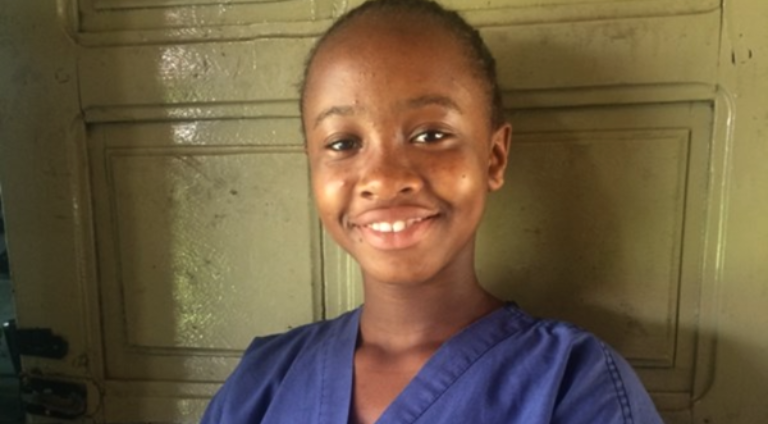 Updates from Liberia Mission, Inc.
One of our students at the mission, Famata Cephas, has lived with a physical disability of her left leg for many years causing her leg to bend and for her to endure much pain. 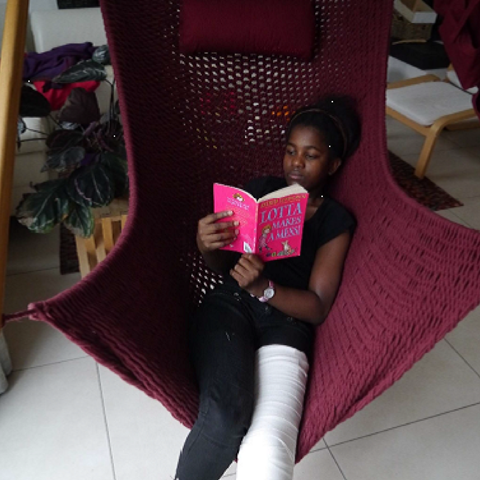 In September, through the support of a friend of the mission, Famata was able to travel to Germany to seek treatment of her leg. 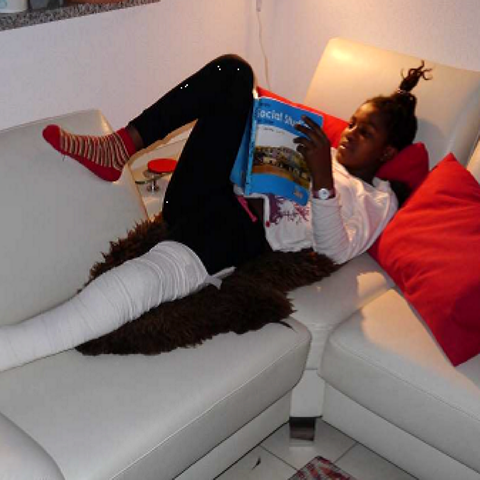 During the week after Famata’s arrival, the examinations of her leg started. 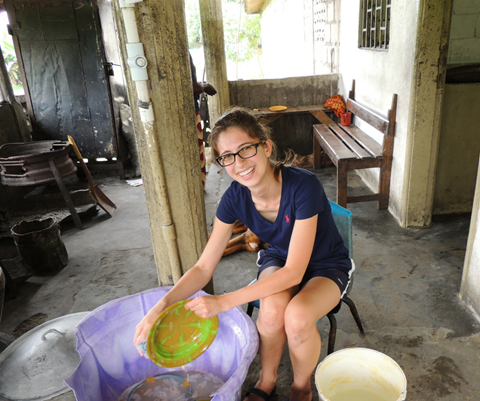 While waiting for surgery, Famata took walks, visited the adventure playground and made multiple visits to the local youth center where she created some beautiful artwork. Famata then had orthopedic surgery on December 1. She had a 9-day stay in the hospital and then return to her host home, where she could not put any weight on her leg for about 4 weeks. 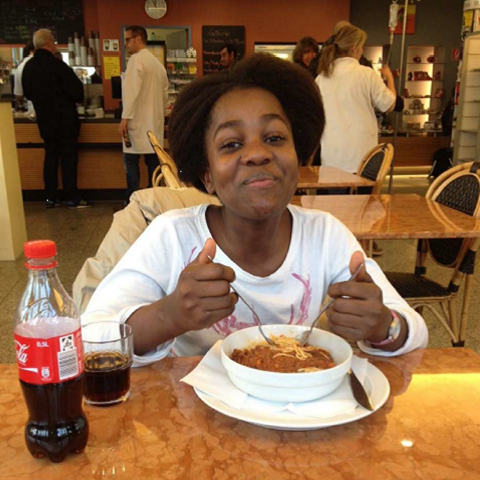 Famata will remain in Germany to rest and recover through January, and will then return to her family and the mission at the end of the month. We are deeply grateful she had to opportunity to receive the surgery she needed to help her leg heal. What a blessing. "Words are inadequate to express how thankful I am to you for the support over the last ten years. You took me from the darkness and brought the light. Seeing me being able to read and write is beyond my imagination. You have given me the education to change the world. You did not just give me an empty education; you gave me an education full of Christ. I am now ready to enter the world to make this Light shine so that others will see Him." -Edwin Kollie, Graduate of Liberia Mission, Inc.
We are an organization rooted in the life and vision of St. Francis of Assisi. His radical, counter cultural service of the poorest of the poor encourages our daily life. In honor of St. Francis, his feast day was eagerly celebrated by our students in October. The eve of the feast was commemorated through a candlelit vigil where our students gathered and prayed. 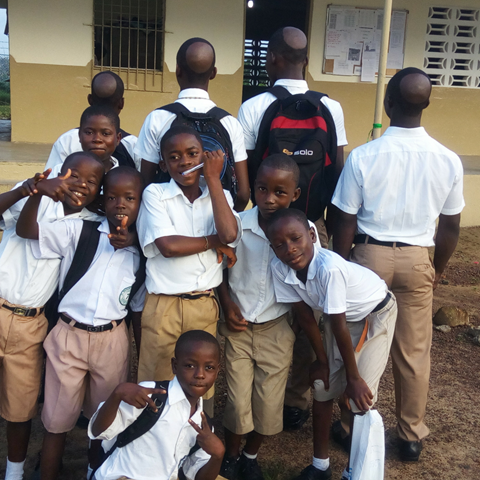 On the feast day itself, our young male students decided to emulate the traditional monk hairstyle known as a tonsure, or a ring of hair around the crown. They were very eager to try on the hairstyle themselves which you can see in the pictures. 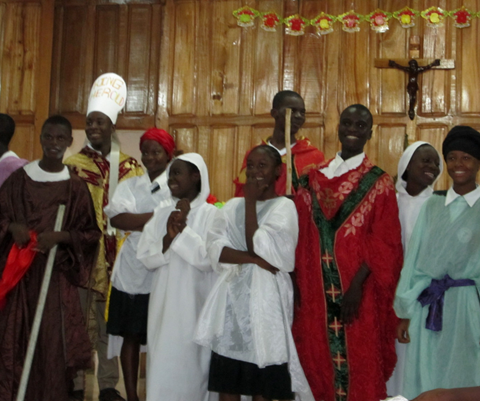 This Christmas, the children at Liberia mission celebrated Advent together in worship and participate in festivities. They performed a school Christmas play, baked Christmas cookies, sang carols and attended a Christmas Eve and Christmas Day Mass together. While in Liberia this year, I heard all types of stories: some heart-wrenching, some lighthearted, but over and over I heard people tell stories of thankfulness for the donations the Mission receives from Americans. And it was amazing to see with my own eyes how our donations are keeping Franciscan Works alive and providing a livelihood for so many people. I am, by far, not the largest donor and part of me felt guilty to be the one receiving all the thanks. However, as I talked to people and got to know them, I realized how grateful they were to just have someone to thank in person. It hit me that I wasn’t in Liberia to do anything great or majestic. My time wouldn’t have any dramatic impact on the people or the county - I was there simply to be with the people! I thought often of the spiritual works of mercy. I was there to be with people who have endured years of suffering, and to offer a face that represents all the American donors they want to thank. 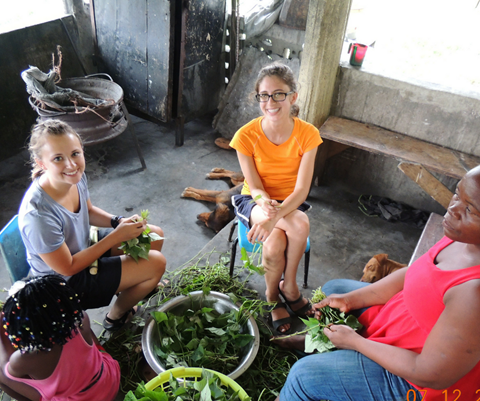 I learned that while it is important to financially support these people, money is not the only thing they need. They need us! We are a universal church and it is our duty to offer them our love in action. It probably won't come as a surprise when I say that living and working with over 50 children can be challenging. Each child is wholly unique, and yet in many ways, children are children no matter what country you are in. Like a parent, I am often frustrated with them, but every day I am reminded of why I chose this type of work. I am reminded when I see their faces light up when they get a letter from their sponsor or when I watch the celebrations they have when they beat other teams in a football or kickball match. I'm reminded when we celebrate the most improved students or one of them comes running to tell me they did well on quiz they were nervous about. I'm especially reminded when I listen to the choir during Mass, seeing the light of God shining through each of them as they sing at the very top of their lungs. As I write this, I have just passed the 6-month mark of being in Liberia. I've thought a lot about what I would go back and tell myself, if I could speak to myself before I left America- I would tell myself that though this work is hard, these kids and the people of Liberia are 100 percent worth every ounce of blood, sweat, and tears. Thank you to everyone who joined us and Most Reverend Joseph N. Perry for Harvest for Hope in October. 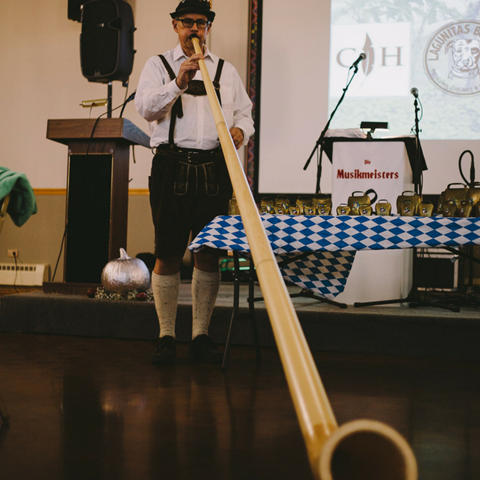 We had a great time enjoying Octoberfest music and hearing from our new Mission Director, Greg Caudle. We raised almost $20,000- thank you to each person who gave! At Harvest for Hope, we presented four awards honoring the generous sacrifice made on behalf of the children of Liberia Mission. Join us in congratulating our honorees. This award was given to the O'Driscoll family in recognition of their tremendous sacrifice and dedication to the well-being of the children at Liberia Mission. 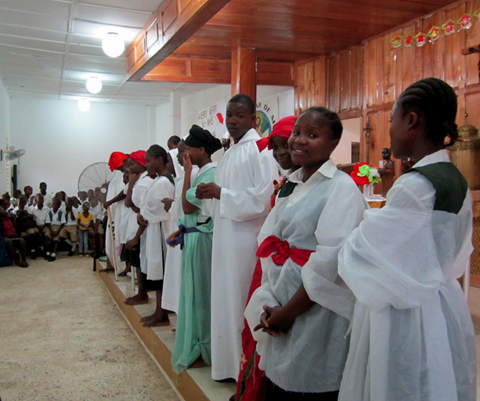 The family continues to support twelve students at Liberia Mission through their parish. Their daughter, Mary Ann O'Driscoll, was a mission director and dedicated to the lives of the poorest of the poor. She died in July 2015 following a hit and run accident in Liberia. Mary Ann's spirit continues to live on in the students and all those who were touched by her life. This award was given to Kathy O'Dwyer to recognize her continuous efforts to help Franciscan Works + Liberia Mission flourish. 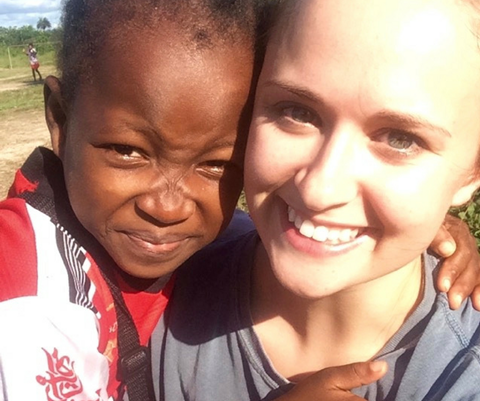 Just as St. Clare believed in uplifting the poor through the power of the gospel, Kathy is dedicated to transforming the lives of the poorest of the poor at Liberia Mission. This award was given to Kurt Heyrman to recognize how he selflessly serves the poor, shows devotion to Jesus and the Church, and shows generous support and leadership on behalf of Franciscan Works + Liberia Mission. He and his wife sponsor numerous children that reside on the mission and his tireless generosity truly blesses our students. He also speaks on behalf of the children at Liberia Mission to raise much needed funds. This award was given to Father Carville to recognize how he displays hands-on leadership in guiding Franciscan Works + Liberia Mission. He has also given freely of his time and talent to further our goals. Father Carville has traveled to Liberia multiple times and provides support through various foundations. He also travels to other nations on missions in service to the poorest of the poor.